After a lifeless first half, Florida A&M football stormed back to erase a 15-point deficit against the defending MEAC champions North Carolina A&T Saturday afternoon. Thanks to a resilient FAMU defense, and plenty of costly penalties from the opposition, FAMU was able to score 16 unanswered points in the second half, including a 70-yard drive with nearly two minutes left in the contest to hit the game-winning field goal. The Rattler’s offense struggled to get going in the first half, as FAMU quarterback Ryan Stanley started the game with a completion percentage under 50 percent and a first quarter interception. Special teams were also a struggle for the Rattlers in the first half. 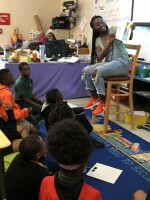 FAMU allowed a tipped and a blocked punt, missed a 44-yard field goal, missed an extra point kick and opened the game by allowing a 100-yard kick return touchdown. The only thing the Rattlers were able to rely upon all game was their stout defense. The defense was spectacular all game, limiting the Aggies to only 74 yards rushing and forcing two turnovers, one of which was a forced fumble returned for a TD. On top of all that, the “Orange Crush” defense was able to completely shut out the Aggies offense in the second half allowing zero points on all four of NC A&T’s second half drives. “We wanted it more than them,” said FAMU corner Orlando McKinley. “All of the no calls by the refs, and the smack talking by them (NC A&T) just fueled our defense and we went out and we executed.” In addition to FAMU holding them completely scoreless to close the game, the Aggies were also constantly shooting themselves in the foot with penalties. The defending champions cost themselves 131 yards on 13 penalties in the game, which helped sustain some key FAMU offensive drives including the game-winner. Ultimately though, it was up to the Rattlers to capitalize on their chance to complete a season defining comeback. 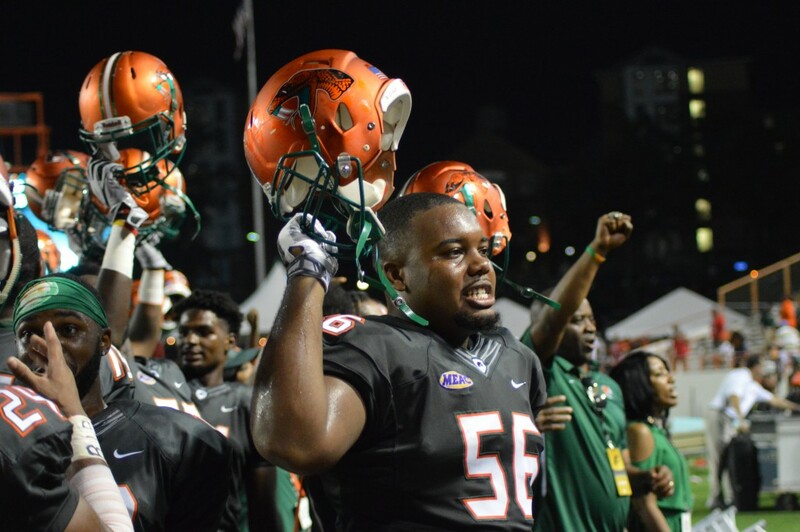 With FAMU’s defense giving the Rattlers a chance, and FAMU’s offense being able to get back on track in the second half, the Rattlers did what many deemed impossible to remain undefeated against the MEAC. “I tip my hat to the team, we overcame some early adversity,” said FAMU head coach Willie Simmons after the game. “These guys never quit, they kept fighting, kept believing…and they showed us today how resilient they are. They showed that they can overcome any adversity that comes their way.” The Rattlers will be on a BYE week next Saturday, and their next game will be at home against the Morgan State Bears on Oct. 27.